There are very few areas, when undertaking bathroom remodeling, that you will find a larger selection of products to choose from that basically all serve the exact same function then with the shower and tub faucets . Before commencing this project you should determine if you have the necessary DIY skills to undertake this complex home improvement. Changing a shower and tub faucet is not an easy project as it generally requires that wall coverings be removed. Removing ceramic, porcelain or natural stone tiles is not easy to do without damaging them and even if they are removed intact it is necessary to remove the adhesive from the back before they can be re-installed. In some cases it is possible to access the valve assembly from behind which might mean the removal of drywall rather than tile. Before you buy a new shower and tub faucet set plan your method of access. It is much easier to replace them if you are contemplating a total bathroom remodeling project. Today, the most common shower and tub faucet is a single lever, providing hot and cold water mixing. However, the traditional style faucet with a separate hot and cold valve and a center diverter (shower head or tub) are still readily available. Both the single lever faucets and the multiple valve faucets come in numerous styles, finishes and quality levels. Many of the single level faucets also provide for pressure equalization, so that a change in either hot or cold water pressure will be automatically compensated for. In theory this maintains a constant water temperature. Other units have the option of having a maximum water temperature, should the cold water decrease you will not be scalded by the hot water. If you are remodeling and do not want to replace the wall surface or have a shower or tub enclosure and currently have a traditional faucet, the holes will not match a single lever faucet. You can purchase a cover plate which will hide the holes of the traditional faucet and provide a hole for a single lever faucet. These cover plates are also available in numerous finishes and styles. If you are installing a spa type tub, you may wish to consider deck mount faucets with a waterfall spout. Many manufactures are now providing life time guarantees on the valves. When dealing with a shower and tub faucet this is an important benefit. If you can replace a valve stem rather than a complete assembly you might save having to rip out tile and enclosures in order to replace a leaky faucet. When it comes to the spout to fill the tub, most shower and tub faucets include a matching spout, however there are also many options available. If you are buying a separate spout, make sure that the finish actually matches. Chrome glosses vary as does other types of plating between manufacturers. A brushed nickel from one manufacturer may not match the brushed nickel of another manufacturer. Although one pays for what one gets, in the case of faucets in many cases the price is not relevant to the quality of the valves, but more to the design and finish of the enter assembly. It should be noted that while most shower and tub faucets have matching sink faucets, this is not always the case. 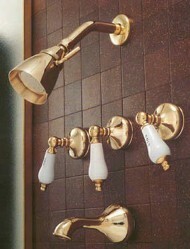 If you want to have matching faucets throughout the bathroom it is wise to purchase all of the units at same time.